In this tidbit, I want to show how we can limit the range of motion within the parameter calculations. We do this in Simulation, and in our Assembly warnings, but did you know we can do this in the actual part design? I spend far too much time in my part layouts, because I am often designing very small parts that have no room for overlap. I don’t want to recheck everything with each major change, and subsequently I constrain everything together based on the design requirements. It is quite painful when there are portions of the design that have a minimum clearance distance, but that cannot stay at that value. 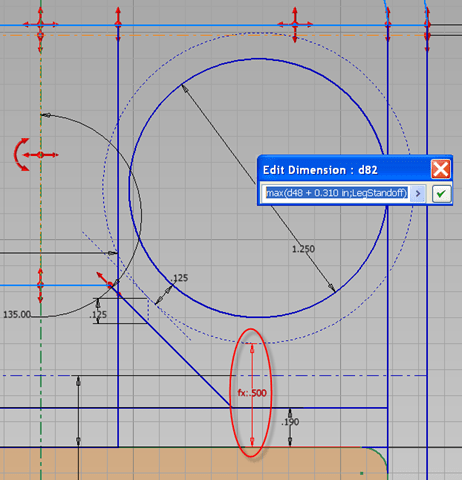 I need to vary this distance during the design process, but this value can never be less than X. Inventor allows this to be added to the parameters. Min and Max can be used as an algebraic equation to evaluate the contents of a parameter and limit it’s range. max sets the a minimum range a parameter can shrink. min sets the maximum range a parameter can grow. It is opposite of what you would naturally think. Max must be greater than or equal to something, and min must be less than or equal to something. In the image below, I have an assembly skeleton that is currently in design. The lower portion of the design must be able to move up and down, and not interfere with the circular portion. 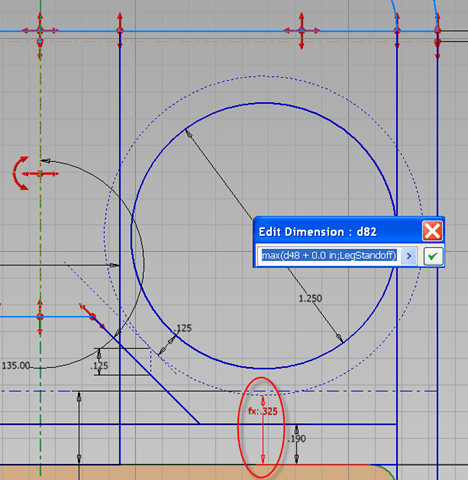 I have set a parameter ‘LegStandoff’ as the minimum distance the circular portions can be to the tan shaded surface. In this example, the part thickness is added to a spacing factor to assist the remainder of the design. In this case the contents of the equation are carried out completely. In the example below I have changed the spacing factor. In this case the contents of the equation are carried until they move into the range of max movement. At that point the clearance allowance (set by max) is adhered to. Now we can comfortably change parameters throughout the design, and be confident that this value will be free to change, but not less than the spec’d limitations. They can be combined algebraically to form multiple limits as well. There are so many ways to use these functions. It’s all up to your imagination.